Every town has an ”it” girl: The one that shines just a little too brightly, lives life a little too fully, and yet still manages to draw the attention of everyone. Fellow teens, grown men, the town gossips—they all crowd around her like moths to a flame yet still keep their distance lest they get burned by her intensity. In the small rural town of Washokey that girl is Mandarin Ramey. In a town of the ordinary, Mandarin manages to be both an exotic attraction and a walking rumor mill. Wild behavior, complete disregard for social expectations, and a beauty that makes grown men fall to their feet have all made Mandarin a girl of both myth and reality. However Mandarin Ramey is not our protagonist. She is simply everything our protagonist longs to be. Grace Carpenter is everything Mandarin is not. She is smart, a loner who chooses to stay safely in the shadows and observe all that goes on around her including the life of Mandarin Ramey. The two girls could not be more different. If Mandarin were a color she would be a bright orange bursting with fire, while the much younger Grace would be a pale pink or blue—a wallflower wanting to blend in but also secretly dying to stand out. When Grace and Mandarin become somewhat improbable partners for a school project, an unexpected friendship unlike any other in Washokay, Wyoming, begins. Grace will do anything to be seen, and Mandarin is the master at the art of drawing attention—but just what kind of attention does Grace truly want? A few weeks as the sidekick of the wildest girl in town soon teaches both girls about true friendship, ultimate betrayal, and the reality of freedom. 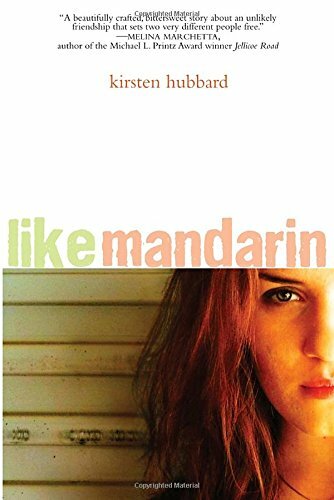 In a work of realistic young adult fiction Kirsten Hubbard has delivered a stunning debut that addresses many of the tough issues facing today’s teens including peer pressure and the expectations of popularity and conformity; however, she also digs deeper to what lies beneath characters. Grace and Mandarin could not be more different, but in the end we see that each have wounds, desires, and pasts that make them more similar. Exploring the teenage search for identity while also tackling controversial and yet relevant subject matter for teens, Like Mandarin is a story of two girls, one friendship, and an unforgettable few weeks in a small Wyoming town.